Hey friends! It’s the newest knit blanket sweater! 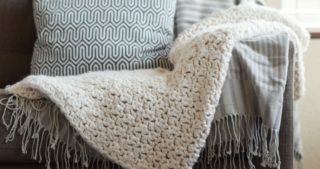 One of the most popular patterns on my blog has been the Easy Knit Blanket Sweater, and this is truly a takeoff from that design. Let me just start off by filling you in on the important features of this newest knit cardigan pattern. 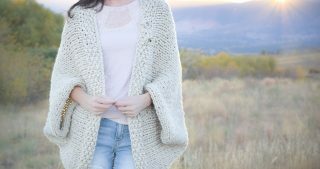 Much like that sweater, this cardigan is super comfortable, beginner friendly, and fairly quick to make. If you can knit a scarf, you can make this as it’s essentially a rectangle that is folded and seamed. There are no fussy extra sleeves to add, and it still turns out to be a comfortable, drapey sweater. And even though you won’t be adding any sleeves, I’ve made this one longer and wider than my original Easy Knit Blanket Sweater so it actually has sleeves built in! If you follow my blog, you know that I’m all about easy patterns that are fun to wear. For this reason, I’m super pleased with how this project turned out and I’m loving these two colors together! 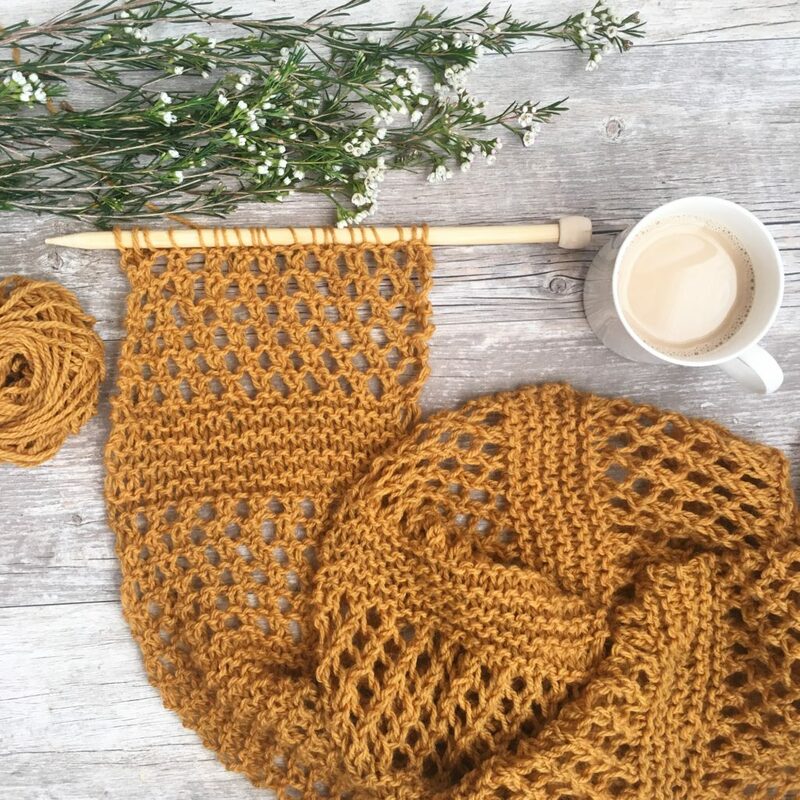 As usual, you can scroll down to see the free knitting pattern below, or you can find the kit available from Lion Brand here (20% off for a limited time), as well as the ad-free PDF available for purchase in my Etsy shop HERE. The sizing is roomier than that first knit blanket sweater that I made. I also find this one to be even more comfortable to wear, probably because the yarn is a bit lighter. It stays put on my shoulders and is light and drapey which I love. If you do find that it begins to slide off the shoulders, you can become really creative by adding a button, clasp or tie of some sort to close the front and hold it in place. While I usually add a button, I didn’t find that I needed to with this particular cardigan. This yarn is also amazing! If you’ve never tried the Lion Brand Wool Ease yarn (HERE), I highly recommend it. Not only is it a soft wool blend, the colors that are available are some of the best colors I’ve seen available. I LOVE the Blush color as well and I can’t wait to get my hands on some. 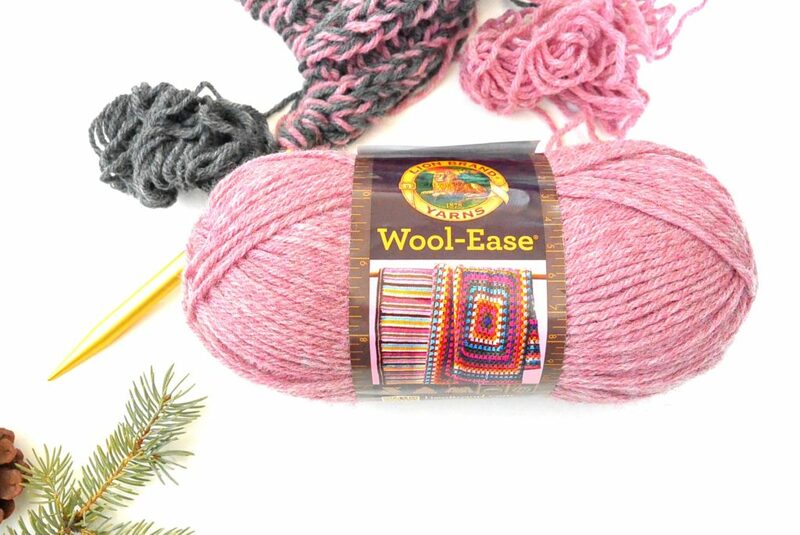 I love the high end look of Wool Ease – and this color!! Below, you can see how you knit holding the two colors together at the same time. It’s so squishy, soft. 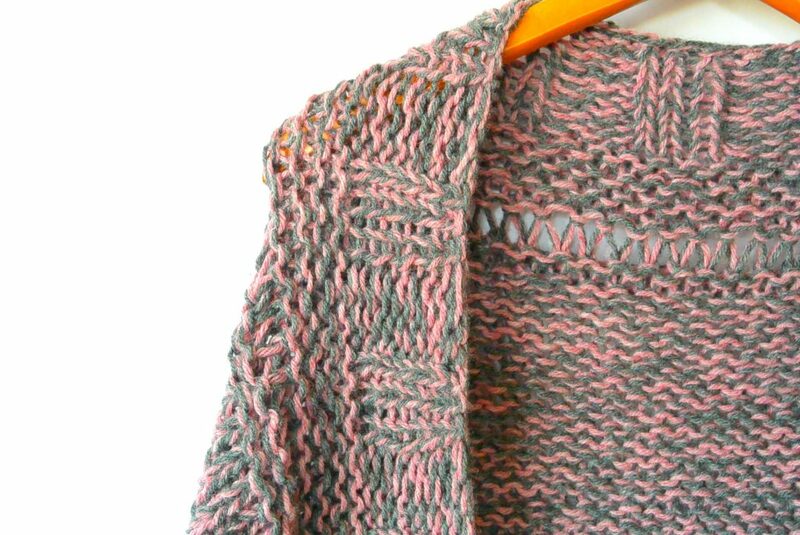 The neckline of the cardigan features a wide rib pattern, garter stitching and a row of drop stitches. I think it adds just enough texture and interest to make it fun, but also keeps it classic for everyday wear. And if you’ve never done drop stitches, fear not! You can skip the drop stitches completely and replace those rows with the stockinette that is worked throughout the pattern. However, if you’ve had some knitting practice, drop stitches are a breeze. You can check out just how to do the drop stitches from New Stitch A Day here. You will knit this on circular needles but it’s not knit in the round! You simply use the circulars because they are long enough to hold all of the stitches, but you knit just as if you were using straights. 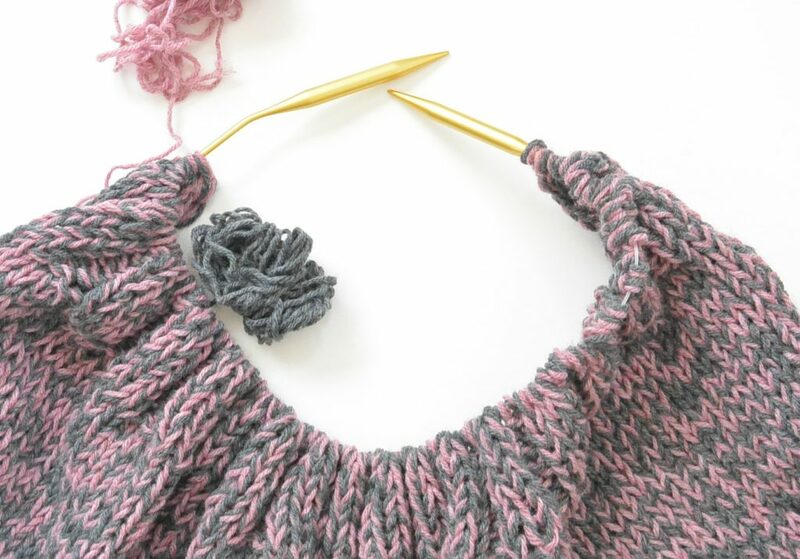 If you have never knit straight on circular needles, you are in for a treat! I prefer circulars over straight needles any day as I find that my stitches don’t fall off as easily. First, you will begin by casting on stitches and will work in a ribbing pattern. Next you’ll work into a garter stitch pattern as well as do a row of drop stitches. This will make the edges pop! 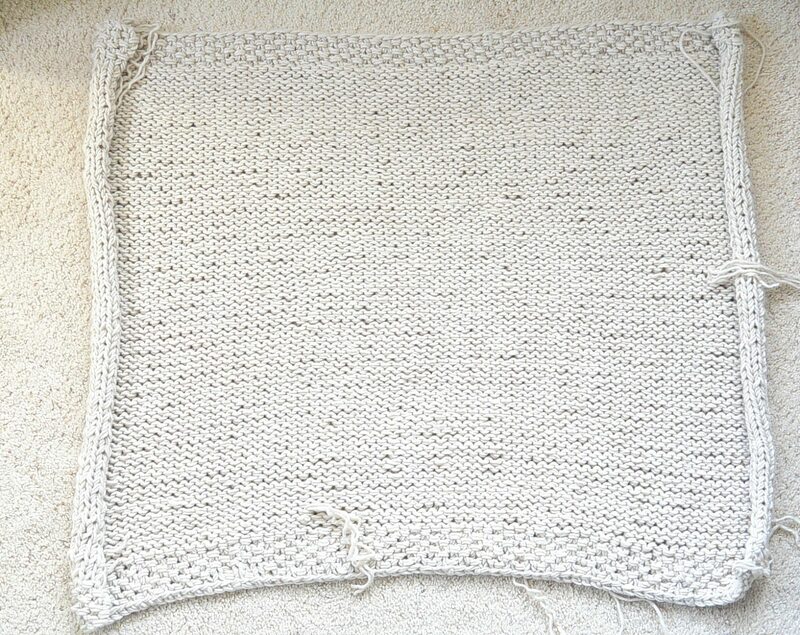 Second, you will knit in stockinette stitch for the majority of the pattern. This means you will knit one row and then purl the next row. Third, you will finish off with another ribbing pattern, cast off and get ready to seam the arms. Last, you will fold the piece in half (or fold the corners inward as I’ve done for my past blanket sweaters) and seam inward leaving holes for the arms. You can see exactly how it’s done in the diagram below! Okay, so now let’s get into this pattern! Find the free pattern below or the printable version available for purchase on Etsy HERE! 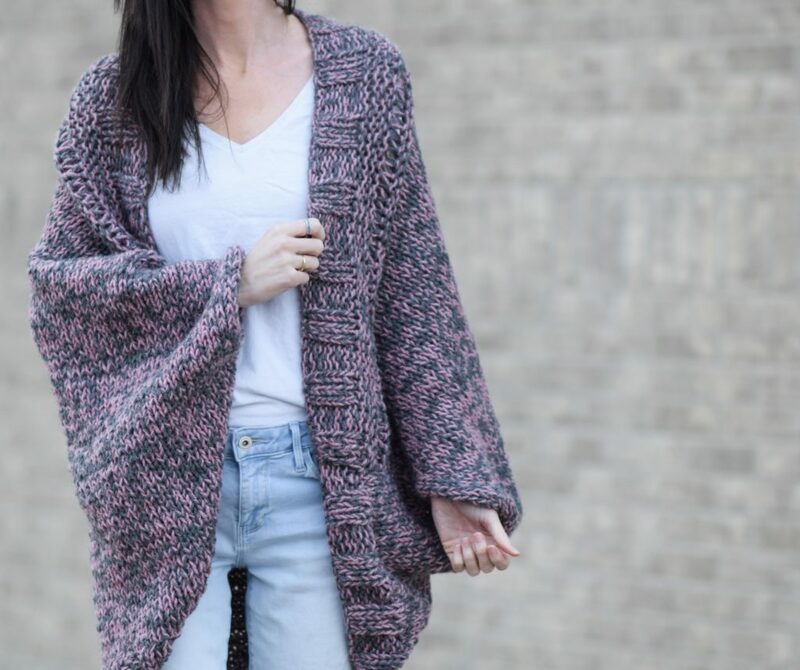 With incredible drape, a relaxed fit and trendy marled fabric, this is sure to be your new favorite cardigan! This beginner friendly pattern works up quickly on large needles and is simple and fun to make. 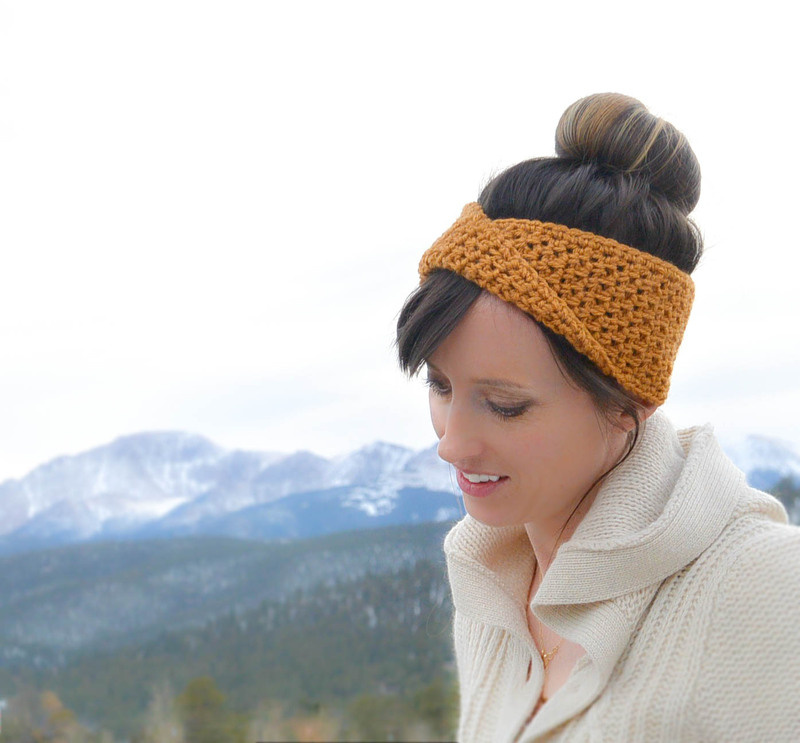 Create a comfy, beautiful piece that you are proud to wear even as a new knitter. 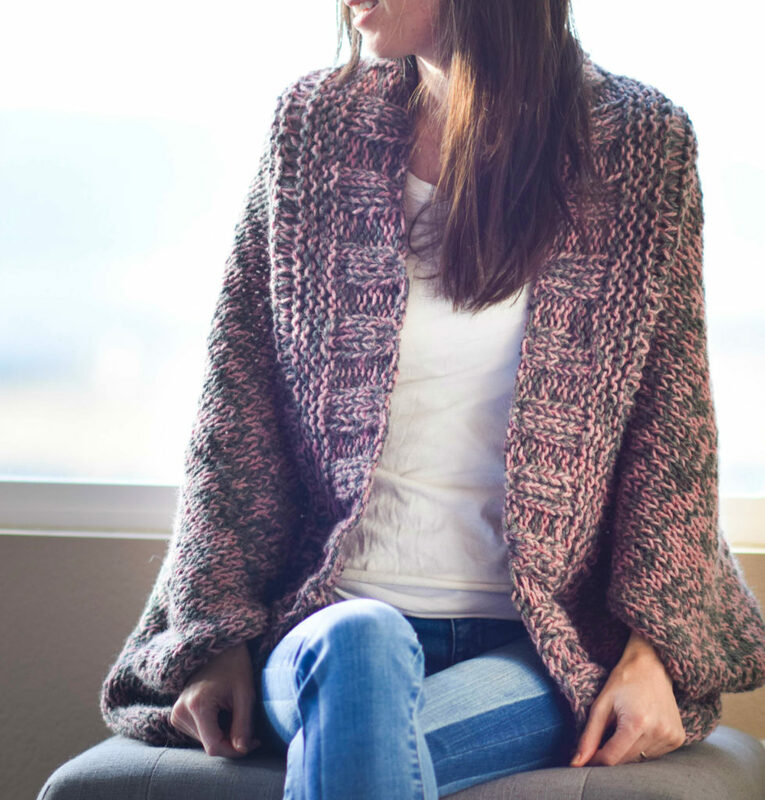 This simple knit cardigan is made by creating a rectangle and folding to seam for the arms. You should be comfortable with the knit and purl stitches as well as yarn overs. The yarn overs are used to create simple drop stitches in the pattern along the neckline. If you’ve never tried drop stitches, there are a lot of great tutorials that you may find online by doing a simple search. This shrug is knit holding two strands of yarn together throughout the pattern. Right Side refers to the stockinette side and Wrong Side refers to the side with reverse stockinette. Two sizes are available – S/M, L/XL. The boxy fit of this shrug stretches to fit a variety of sizes. 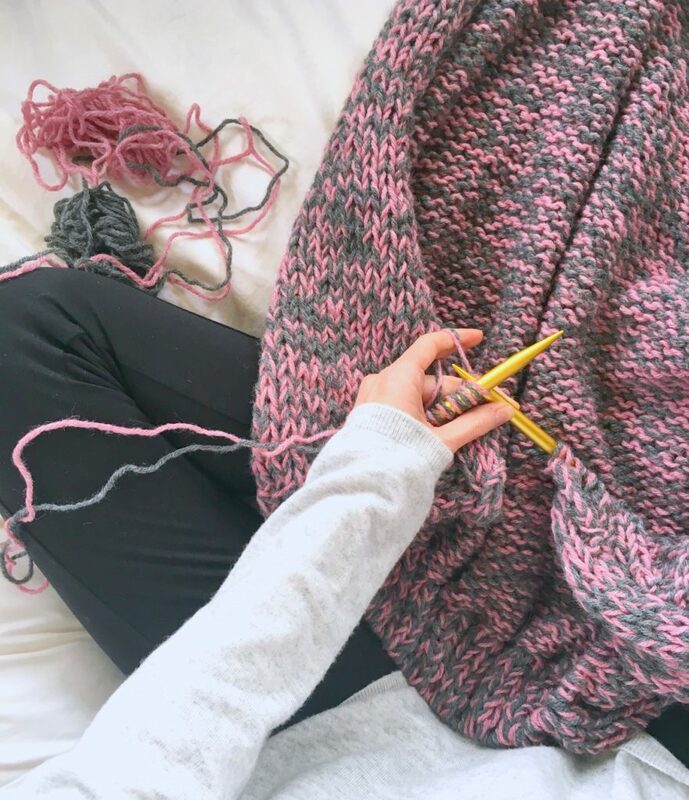 Tip: Check your gauge and measure after many rows to ensure your size is turning out correctly. The pattern is forgiving, so if your measurements are slightly off, you will still have a cute cardigan. 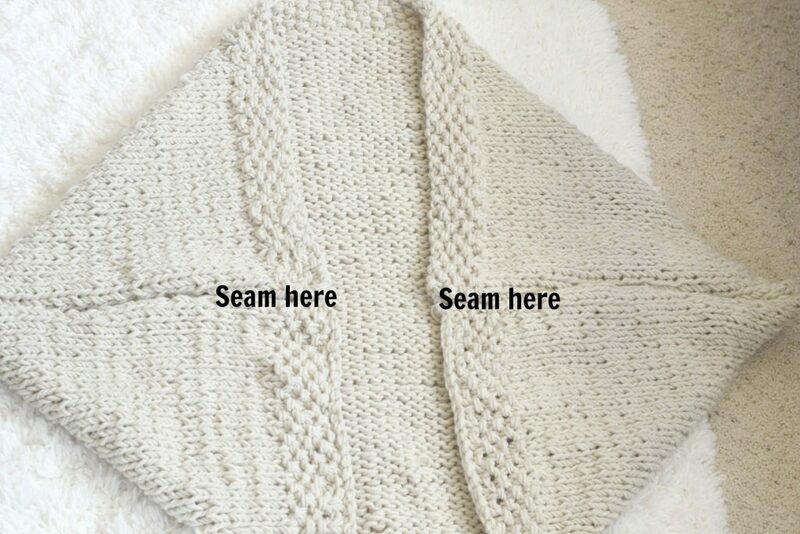 See the diagram at the end of the pattern for additional help on how to seam in order to finish the cardigan. Repeat rows 1 & 2 for approximately 3”. Tie off and weave in ends. You can fold as I’ve done here in the photo to seam, or you may fold as I show you in the diagram below. Either way will work just fine! Seam and leave openings for the arms! That’s it my friends! I hope that you love your brand new cardigan and please let me know if you have any questions or comments about the projects! Previous Post: « London Kaye Theme Packs Giveaway! Looks SO comfy! And easy! I’m going to try the Easy Knit Blanket Sweater first, then think about this one! Thanks, Jessica! Awesome Janet! And you’re welcome of course! Very pretty – thanks for the free pattern. Looks very comfortable too. Hi Tanya! So glad to hear you’re enjoying the drop stitch cardigan! Hope you love how it turns out! Love the cardigan Jessica! I’m thinking beige and white would make a lovely combination. Thanks for the easy, doable patterns!! Yes, yes, yes! Beige and white would look amazing! What weight Wool Ease is used for this ? It’s a worsted weight 4. Hi Jessica, I love this and plan to make some for myself and my daughter and daughter-in-law. They look so cosy! Hi Sandra! I hope you enjoy making them! So pretty! I’m pretty obsessed with the drop stitch right now. This looks so cozy. I might have to give it a try with some heartland yarn that I have. I have two sweaters on right now. Snow on the way. Can’t wait to make this cozy sweater. Thank you for providing the beginner pattern! This looks so cozy and comfortable! I didn’t realize how easy the pattern was until I went through it… I’m thinking of making one for my daughter. Thank you Jessica; love your work a lot! I’m so excited to make this! these colours really inspire me. I usually crochet wayyyy more than I knit but I try to knit one project per year. 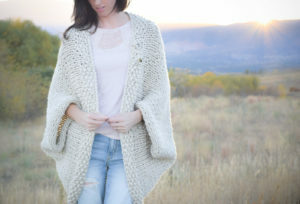 Last year was a big bulky sweater, this year will be this cardigan! Thanks so much!! Hi Jess: I think I remember you saying you had inlaws from Canada–wonderful–great country. I’m the lady from Ontario. 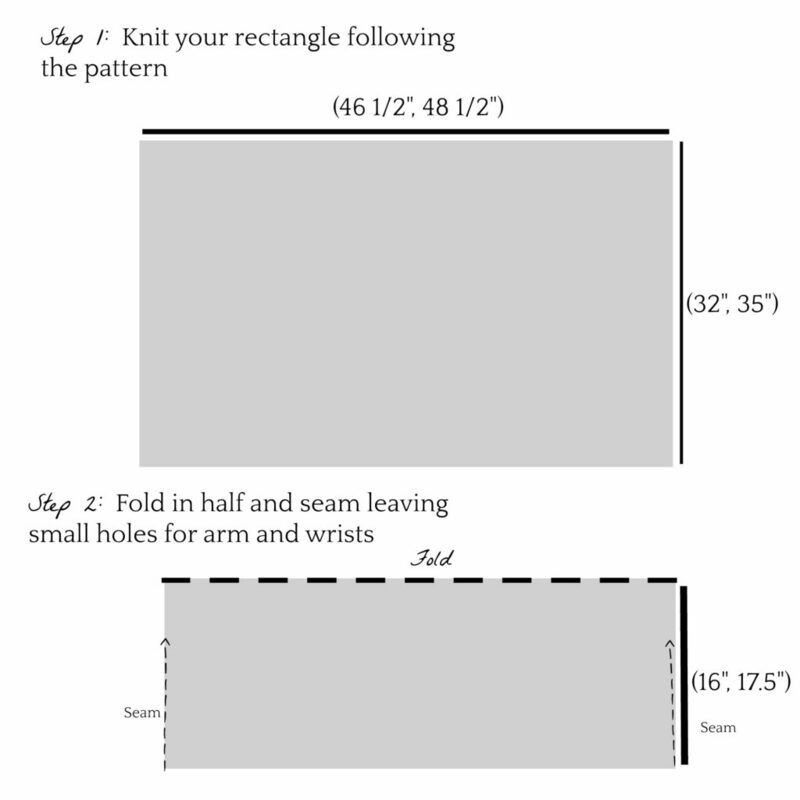 Can I use a 12 mm, 35 inch circular needle for the marled knit cardigan pattern? My thoughts would be that I would have to knit tighter or do you recommend purchasing the proper size needle. Not doing it now but appreciate your expert advice my friend. God Bless from Ontario, Canada. I’m making this one right now using Paton’s Denim-y in So Green Denim and Light Blue Denim. About halfway through at the moment and loving the way it’s coming out. This version of the pattern doesn’t appear to be listed on Ravelry yet, but I’ve put your website link on my project page. Sounds gorgeous Sandy! I haven’t put it up on Ravelry – in fact, I have a lot of patterns that aren’t up there. It’s always on my to-do list! Very nice color combo and I love Wool ease, it really holds up well. I would like to know the difference between your Easy Knit Blanket Sweater and the Relaxed Marled Cardigan. I am not seeing a difference, but there must be! Please explain. Thanks for your blog…..I love reading it. This one uses worsted weight yarn while the original uses chunky. There are also different stitch patterns throughout such as the seed stitch vs. ribbing. So glad that you enjoy the blog Nancy! Have just completed my cardy in black and purple wool. Lovely and so easy. Not nearly as large as the one in the photo’s, (did the s/m size). Thinking of making a larger one for an even cosier caddy. I love this! 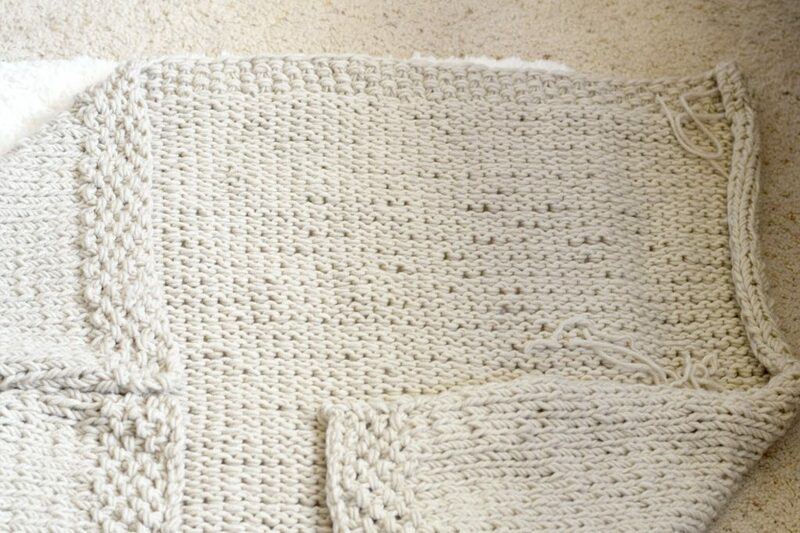 Question—I’m very tall (5’11”) and when I tried to make one of your other blanket sweaters in a large (the one with black stripes), it came out too small and short for me. I normally wear a M or L in tops, so I’m thinking it’s my height that’s the issue. Would you recommend just making it longer? Hi Lauren! That particular sweater was on the smaller side for sure. This one is larger, but you can certainly add more length to it if you’re 5’11”. That would help for sure! Love the look of this sweater! 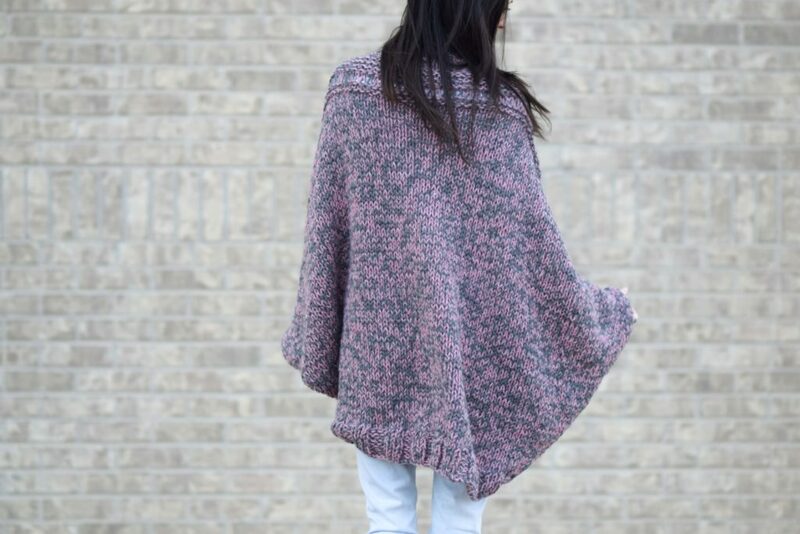 I am planning on making one for cold weather, but I am wondering if it is possible to make one for warmer weather to wear to movies or to go out to dinner. I like to take a sweater with me since places tend to be on the cold side sometimes. Any suggestions? Thanks. Making this as we speak. I looove your patterns! They have given me alot of confidence as a knitter. This is 4th sweater of yours I have made. Awww, that’s so awesome Rhonda! Thank you so much for the kind words and congrats to you on making your 4th sweater – wow!! Yes, that’s exactly where you leave the arm opening! I was wondering the same thing. Cause it doesn’t show the holes in the diagram in the pattern. I am making one right now. This will be my first knitted cardigan. I have been knitting for 10 yrs, off and on, I have never made a sweater. This looks really simple. Thanks for the pattern. Thank you for the great pattern instructions! It looks very cozy and warm. I am going to do one up for my niece. I found you on Pinterest. Hi Kim! So glad you like it. And I love Pinterest too! I am now making this marled sweater. 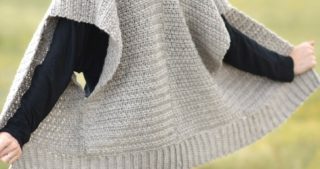 When I read your instructions for sewing it together, I could not “see” that the diagram for the marled sweater finishing is the same as the blanket sweater, even though you posted photographs. I don’t “have” the ability to envision something like most other people do. So I got out a rectangle of fabric and you are right … they are both the same! I also had to come back and look at the finished sweater to make sure that the two ends are done differently. I like the dropped stitch around the neckline. Nice Touch!! Thank you for all your beautiful designs. You are tremendously talented. I have overcome the problem of sweaty hands in the summer by wearing those thin gloves that are made to wear to bed with hand lotion?? Works fine in the summer time!! Keep up the good work. I’m a fan! Hi Jean! 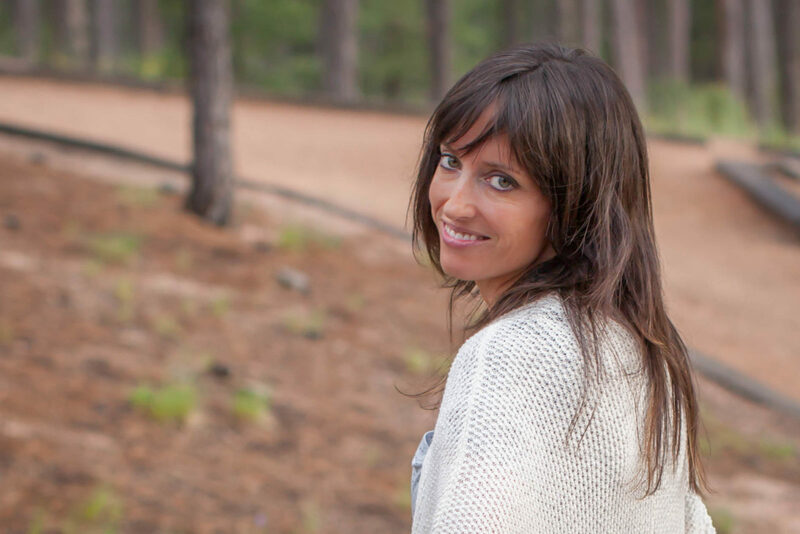 Thanks so much for taking the time to leave me your thoughts and comments! I’m so happy you’ve enjoyed the blanket sweater patterns and that you like the most recent drop stitch at the neckline! And what a great idea to overcome the sweaty hands by wearing those light gloves! Thanks so much for sharing. Again, I’m so glad you like these patterns and thank you again for reaching out Jean! You’re welcome too!! Haha! Hi Jessica, I made the marked sweater for my niece going off to PA school . She loved it! It was a pleasure to knit & I bought the kit from Lion Brand website. Your pattern was so easy to follow ! Thank you for the great patterns. Hi Gerrie! Thanks so much for your support and kind words. That’s so nice of you to make it for your niece. Good luck to her at PA school! You’re so welcome for the pattern and I’m thrilled you enjoyed it! If you feel so inclined, you can also leave a review on the kit on the Lion Brand site which helps me out too. Thanks so much again for the kind words and for taking the time to let me know how it worked out for you. Have a great night and happy knitting Gerrie! I am thinking of using a bulky yarn for this in navy and white. Should I make any adjustments to the number of stitches possibly? I love the patterns on here. So I’m going to make this but will be using Yarn Bee effortless super bulky. It’s 80% acrylic and 20% alpaca. The yarn is shedding so is there a way to eliminate that problem? Hi Jessica I made this pattern but did it in garter stitch due to the yarn I used, Lion Brand Scarfie. Anyway the piece is 32 by 46.5 and if I am looking at the above diagram correctly, if i fold the piece in half and seam for 16 inches there will be no armhole, Please advise. Thanks!